How did our parents manage to make us all feel important? My mum helped me when I was studying for the 11+. She was "expecting". After the first few, all mum’s confinements were at home. The news was brought downstairs that the baby had been born. I rushed up to congratulate mum and see the new baby. I brought my books with me, and asked mum to help me again with my work. So much for rest and recuperation. And she did, though I don’t think she could see the pages too well! Despite the large number of siblings in our house, I never remember feeling "left out". 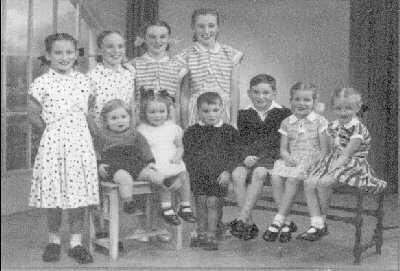 All these children are now grandparents in their own right! Midwives and district nurses were like family friends. Nurse Grant and Nurse Mulvanney (Dr Aidan’s mum) delivered most of us. They used to scold mum who would have the knitting or darning needles in her hand within the hour of delivery. When mum was in bed in the days after, we would bring her a bag of potatoes (and a basin of water) to peel for the dinner. Wasn’t that thoughtful of us! All the children were breast-fed. The fire in our parent’s bedroom would be lit and the baby would be fed there. Some of us older girls would occasionally sit with mum. It was a quiet, intimate, and for me a privileged occasion. Doctor Mallon was a regular caller. In fact he’d just turn the handle of the back door and walk in. He once surprised mum there scrubbing the floor. She reacted instinctively. Goodness, Sunshine, you scared the heart out of me! Everyone called him that, but not to his face! I have happy memories of a horde of sweet-smelling well-scrubbed children on bath night congregated in the living room, where the sofa converted to a double bed. The oldest boys had to share this and they couldn’t get to bed until everyone else had retired. Daddy used to tell us ghost stories or we would while away the hours reading or making jigsaws. Happy days before the advent of radio or television! I didn’t like Mondays when Mum tried to catch up with the week’s washing. Dinner that day often consisted of home made vegetable soup with boiled potatoes, or ‘bubble and squeak’. That was fine but these smells combined with the smell of boiling clothes produced an all pervading, unpleasant odour. My mother liked to sing, especially when washing or ironing. I remember her ironing a mountain of clothes and happily singing her favourites. Among these were "Yours", "Just out of Reach", "My Happiness" and "As Usual". In the morning, Mum would wait for the breadman to come along to help her lift the boiling tub off the gas stove. Mick Campbell was a jovial and friendly man who didn’t mind this chore at all. I remember when he’d deliver bread to our house, both arms would be lined with the plain loaves favoured by mum. We were his best customer, in spite of the fact that mother baked most of the bread we ate. McGovern’s on Monaghan Street would deliver a sack of flour. Our friends would stand aghast and ask what it was for and how long it would last. I think they were proud that their parents always fed them real, bought bread. When they tasted mum’s wheaten and soda their arrogance turned to envy. They couldn’t believe it when another sack was delivered next week. Pancakes on Shrove Tuesday were eaten faster than mum could cook them. She used to borrow a griddle from Mrs Clarke for the purpose. I remember marvelling that there existed a special cooker just to make pancakes and I felt envious of the Clarkes who owned such a wonderful machine. On a Tuesday morning the rent had to be paid. The Family Allowance would have to be collected to cover this bill. Before I was old enough to do this chore, mum had to go herself and find a neighbour to mind us children. This was no great bother. Neighbours were ready and willing in those days. They would always need such favours in return themselves. Mrs Clarke, who lived where Jimmy Magee does now, would usually oblige. The fact that she had a growing family of her own didn’t deter her. She’d take charge at once and organize us like a work detail. By the time mum returned with the rent money, there would be a full line of snow-white nappies fluttering on the line in the back garden. Or Joe Patterson, an invalid man stricken with polio, would occasionally mind us. If the gas ran out and a shilling was needed for the meter, Joe would have to stretch himself prone under the stairs to do this task. Our parents were always careful not to show us any bad example. We did not learn about Northern Ireland’s "Troubles" in any sectarian or one-sided manner. We were all well into our teenage years before we heard the term Protestant, and never seemed to get a satisfactory answer when we asked just what was a Protestant! We couldn’t see how these neighbours were any different from ourselves. In fact, our parents did not speak ill of anyone. Most neighbours became firm friends. I recall the time that Eileen McGuigan, an old but casual friend of my parents got married (to become Mrs Hearty) and spent her honeymoon staying in our house in the Meadow and day-tripping from there! It’s hard to understand how this was possible, perhaps harder to guess why they would so choose, with so many already living there! Even though they had no money and couldn’t afford to go away, why choose such a home? However it shows how friendly and unselfish our parents were. In those days, there was time for people.